This elegant Seksy 2-piece gift set would be perfect for that special someone in your life. 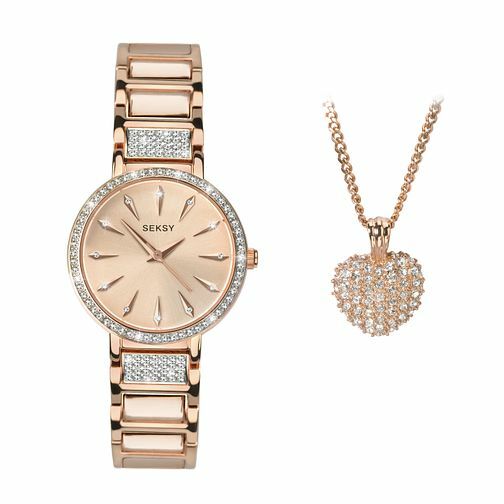 The watch features a rose gold plated stone set case and bracelet, beautifully embellished with Swarovski® crystals. The timepiece is flawlessly finished with a rose stone set sunray dial. This feminine set comes with a matching heart-shaped pendant to add another touch of sparkle and sentiment to your look. This set comes in a perfectly presented Seksy gift box, ready for surprising a loved one with the shimmering Swarovski® crystals. Seksy Ladies' 2-Piece Swarovski Crystal Rose Gold Plated Set is rated 5.0 out of 5 by 7. Rated 5 out of 5 by Anonymous from Excellent Very nice set. Very happy with it. It’s a perfect as a gift for your lovers or for yourself.